Cruise to the best of the Mediterranean and Caribbean on board the majestic Wind Surf, the flagship of the Windstar fleet. The Wind Surf sailing yacht is one of the largest and most majestic tall ships in the world, it is also Windstar Cruises' flagship sailing yacht. The ship has recently been refurbished to upgrade the Suites to the ultimate luxury at sea. 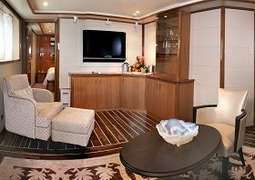 Windstar Cruises is known for its personal touch and it shows when you enter your Wind Surf stateroom: with fresh flowers and fruit waiting for you, and beautiful seascape colours and upholstery it is pure indulgence at sea. With the capacity for 310 guests spread over 122 deluxe ocean view staterooms, and 31 deluxe ocean view Suites, you get style and comfort no matter your budget. From the gracious staterooms with their massage shower heads and waffle-weave robes, to the Opulent Bridge Suites that boast private whirlpool spa and dining areas, whatever your choice, you will not be disappointed. All meals in all venues, along with all non-alcoholic drinks, unlimited use of the fitness center and water-sport equipment are also included in the cost of your cruise holiday. On board the Wind Surf you have the choice between oceanview cabins, Bridge suites and suites. You are guaranteed to enjoy 5-star luxury no matter which cabin you choose. You can look forward to gourmet cuisine aboard the Wind Surf. Three different restaurants are available for your dining pleasure, one of which has outdoor seating for particularly romantic evenings in the fresh sea air. Other fine establishments include a lounge and the Piano Bar, where you can relax with a delicious cocktail, coffee, or soft drink while enjoying the dreamlike view. No matter where you choose to dine, you can be sure to expect culinary delights of the highest quality. The Wind Surf offers entertainment opportunities for all tastes. You can try your luck with a round of Poker in the casino, spend a lazy afternoon browsing through the countless books in the library, or anything in between. The wellness and fitness offerings aboard the Wind Surf are diverse and plentiful. For example, work out in the fitness studio with a fantastic ocean view, leave your worries far behind with a relaxing massage in the wellness area, or try out a new look in the hair salon. Aboard the Wind Surf you have the chance to browse through a sport shop as well as a signature souvenir shop, where you could treat yourself to something special or pick up souvenirs for loved ones at home. The term luxury encapsulates all that Windstar’s majestic flagship Wind Surf represents. Boasting a length of 535 feet and a width of 66 feet it holds true to the classic feel of the ships of days gone by. Refurbished in 2012 it allows its 308 lucky passengers to travel back in time while not compromising the comfort and luxury that one expects from a 5-Star ship of renown. This yacht-style luxury cruise is suited to those seeking a more personal cruise experience. With a capacity of just 308, passengers can share this stately experience with each other in comfort. As the Wind Surf makes a grand entrance into port with billowing sails, so too can passengers make an entrance aboard with a cocktail reception amidst the new finishes and furnishings of this magnificent vessel. Come aboard and experience first-hand the luxury and elegance which radiate from the Wind Surf. You can look forward to a pleasurable dining experience al fresco on the veranda while breathing in the crisp sea air. Choose from one of three eclectic gourmet restaurants on offer to you, one of which possesses an outdoor seating area which encapsulates the romance and beauty of this ship. One of our most popular establishments is the Piano Bar in which you can unwind with a cocktail, glass of wine or coffee and relish in the ethereal views and music that surround you. The Wind Surf prides itself on its comprehensive array of facilities and amenities available on-board. Whether you would rather wheedle away the hours lazily browsing the extensive collection of books in the library or allow yourself to be pampered with spa treatments there’s something for everyone aboard the Wind Surf. 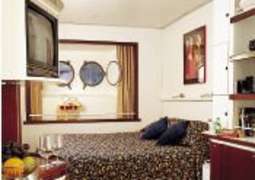 Other facilities include; 2 swimming pools, 2 whirlpools, a beauty and hair salon, numerous quaint boutiques and shops, a stylish casino, a fitness centre and sauna. There are literally no limits aboard this luxurious craft.